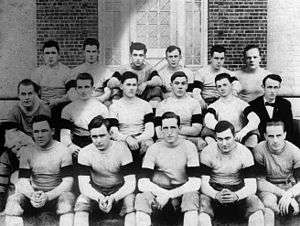 The 1913 North Carolina A&M Aggies football team represented the North Carolina A&M Aggies of North Carolina College of Agriculture and Mechanic Arts during the 1913 college football season. The Aggies competed in the South Atlantic Intercollegiate Athletic Association (SAIAA) and were coached by Edward L. Greene in his fifth year as head coach, compiling a 6–1 record (2–0 SAIAA) and SAIAA title. ↑ "1913 NC State Wolfpack Schedule and Results". Retrieved February 27, 2015.